David Zeis is serving as an athletic trainer on a U.S Men’s National Team for the first time. Zeis recently completed his 11th season as head athletic trainer for the NHL’s Dallas Stars, a role he has held since 2007. 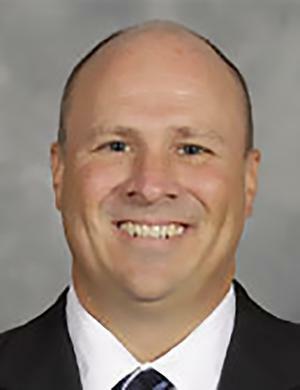 Prior to that, he spent seven seasons as the head athletic trainer for the Columbia Inferno and Pee Dee Pride of the East Coast Hockey League. Certified by the National Athletic Trainers Association since 1995, Zeis is also a certified strength and conditioning specialist. Zeis earned a bachelor of science degree from SUNY Brockport in New York where he also played collegiate hockey. He also worked at University Sports Medicine at the University of Buffalo from 1993-95 as a clinical therapist and research coordinator. Zeis and his wife, Michelle, live in Prosper, Texas, with their son, Brendon. BrockportHockey.com is THE website for anything and everything Golden Eagles Hockey. Check back regularly -- even daily during the season -- for news, scouting reports, game recaps, commentary and more. Brought to you by longtime fan Bob Confer who is in his 26th season of following the team (look for the guy in the #22 jersey). It should be known that the views contained within are not those of the College or the team and instead represent the opinions of Confer.